Last night I went to a get together for the ladies in my community, a meet and greet type of event. As part of the "get to know you" event, people were asked to bring in a food that had something to do with their favorite color. I love blue the most of all colors, but since I couldn't think of any foods (other than blueberries, which I don't have) that had to do with blue, I decided to go with my second favorite color- gold. After all, I had a pack of golden raisins in my cupboard that I bought on sale, and I knew I'd be able to cook up something yummy with those raisins. Golden rice with golden raisins seemed like the perfect combination, so I made up this recipe based on another one that I found, hoping that people would like it, but not counting on it. Luckily, people were raving about it; it was all finished up, and a few people asked me for the recipe, asked me if it was on my blog. Not only was it not on my blog, I didn't 100% remember the changes I made to it... so I decided to try it out and make another batch again today, this time recording the recipe. My family loved it, didn't stop eating it all day. And the lucky part of it- it's all vegan, a full protein, and relatively low cost. 1. Chop the onions small and mince the garlic. Saute in oil until starting to brown. 2. Add the rice, salt, spices, lemon juice, raisins, and 4 cups of water. Bring to a boil, and then put the flame on low and cover, cooking until most of the water is absorbed. 3. Add peas and half a cup of water, stir once, and cover, cooking until the water is absorbed. 4. Roughly chop up the walnuts and add. Mix well. What is your favorite color? What food would you make if you had to bring something with your favorite color? 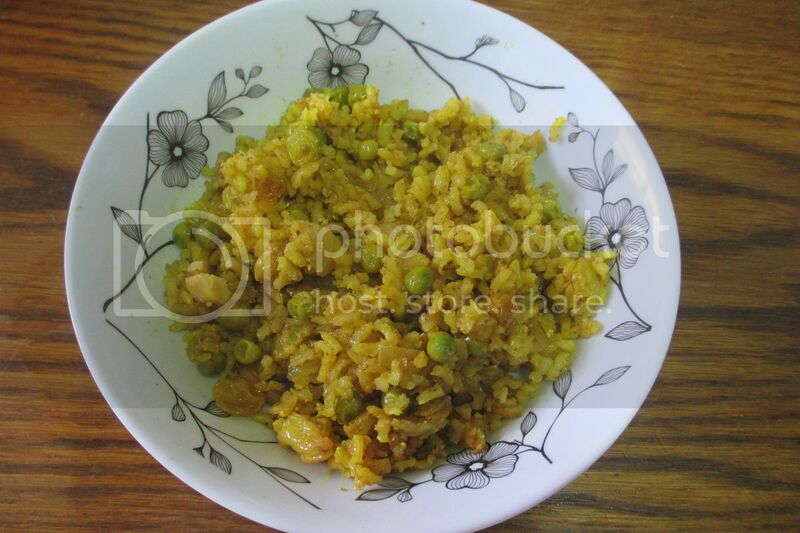 Have you ever had a similar rice recipe to this? Does this look like a dish you'd enjoy? Never thought of mixing raisins with rice. Looks delish, Penny! My favorite color is yellow but for food, I have to say a purple fig makes me the happiest. I love spreading goat cheese on toast and putting slices of figs and drizzling honey to make myself a good fig sandwich. This seriously looks amazing. I'm making it soon for sure. I also love blue, so for food I guess I'd have to go with white and make potato leek soup. My favorite color is purple. It's not a common color in food, but I do like eggplant. My favorite way to eat it is cooked nice and soft, in teriyaki sauce, with mushrooms, over rice. Your rice dish sounds a lot like the biryani that's sold at Trader Joe's, frozen in a bag--we sometimes get it when we will need a quick, very easy meal; it's not as frugal as making the same thing from scratch, but it is much cheaper than going to a restaurant! That has peas, raisins, and red peppers, and we usually add peanuts to make it a complete meal. please tell me how long to cook the rice so i dont have to keep checking it. also how long after the peas are put in? thank you.